The crown says it all. Get this Meow Wow mammoth bouncing, and you've got yourself a battlefield full of royal pancakes. A Meow Wow with a crown. Don't get crushed by its full-body attack! 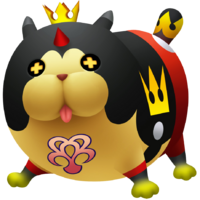 The Meowjesty is a Dream Eater that appears in Kingdom Hearts 3D: Dream Drop Distance. The Meowjesty is a palette swap of the Meow Wow, its design based upon that of Mickey Mouse and his status as a king. Black at the top, red at the bottom, and with two white buttons on it, it resembles Mickey's original costume; the golden crown on its head reveals it as the "King" of the Meow Wow, just as Mickey is the King of Disney Castle. Paint Guns affect the color of the Meowjesty's initially black, top-half of the body. Its Japanese name contains the words "king" and nyan, the Japanese onomatopoeia for the sound a cat makes. Its English name is a pun on the word "majesty", often used when referring to a royal monarch. The Meowjesty Recipe is obtained in the NA and PAL versions once Sora and Riku reach Rank 20 in Flick Rush. The Meowjesty can be created through two different recipes.